As a creative marketing guy, I love a good idea. In fact, I’ve spent many hours sitting in conference rooms brainstorming with teammates to come up with them. So when I first saw Verizon Wireless’ big new campaign called Share America – I was instantly engaged. It is a great concept involving an up and coming band (Hot Chelle Rae), a tour bus, multiple cities, and a concept to unite people across America by inviting them all to sing one of the most iconic holiday songs ever: Jingle Bell Rock. The video was just released on their Facebook page this weekend and has already racked up more than 25,000 likes and been shared nearly 7000 times. The YouTube version is taking off more slowly, with just 1000 views to date (but will likely pick up in the coming days). The problem with the campaign is that it makes the same mistake that many brands are making today with social media … they forget about the power of the people involved to create engagement and help the campaign succeed. Verizon isn’t the only brand to miss this opportunity. It happens all the time. So in an effort to use their campaign as a learning moment, here are five suggestions that could have amplified this campaign and used social media far more effectively to involve the people behind the video and make their shared passion for the project a much bigger word of mouth driver for others to engage in it. 1. Leverage partner’s fan base. The Problem: As part of this campaign, Verizon partnered with a band called Hot Chelle Rae to perform the song in the video. The band has a growing fan base of passionate and engaged people, yet this audience was mostly untouched by the song and campaign. 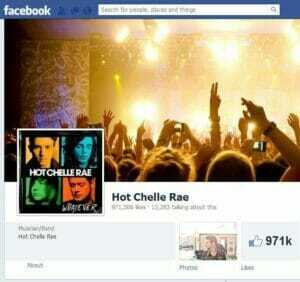 Hot Chelle Rae only posted about it on their Facebook page in passing and there are no links between the two Facebook pages despite the cumulative opportunity to engage nearly 5 million fans between them. In contrast, the same band’s collaboration with another brand (Nikon) is featured prominently on their site and allows a more intimate look at the band through photography that fans are likely to love and share. The Solution: When negotiating the partnership with the band, specify a minimum number of Facebook shares and a featured role for the video and campaign on the band’s website. If they have an email mailing list – pay for the opportunity to send a branded email sharing the video (and not just promoting products) to them to show that Verizon believes in the band they love and is partnering with them. The Problem: At the end of the description of the video on Facebook, this is the call to action Verizon uses: “Watch this video to “Jingle Bell Rock” with Hot Chelle Rae. Then rock a deal here: http://social.vzw.com/koR.” Despite creating great engagement through a fun video, the first thought at the end of a few sentences is to take someone straight to a conversion page to buy something. The link takes you to a sales page with no mention of the campaign or opportunity for further engagement. The Solution: Have a branded landing page that anyone who watches the video can visit to learn more about the campaign. They can see the people in the video, or interact with a map that shows the route the tour bus took. Another idea could be sharing information about the phones that each one of singers were using in their shots and even showing how those phones (and Verizon service) helped them share their experiences in real time. 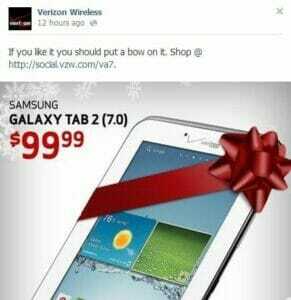 The Problem: Despite the considerable work and time that likely went into producing the video and funding the road trip, Verizon dedicated just a single Facebook post to the campaign and then moved on to putting up photos of a Samsung Galaxy Tab 2 with the prompt that “If you like it you should put a bow on it.” – followed by, of course, another link to the store to sell the phone. When you have great content and potential for engagement, why lapse so quickly back into the desperate attempt to sell whatever new product just came in? The Solution: Create a content calendar that allows you to build a longer lasting campaign out of this effort instead of a single produced video. You could add a component so that people who were not in one of the target cities could record their own versions of the song and share them. Or at the very least share the unedited footage of the people in the video actually singing the song instead of lip syncing to Hot Chelle Rae’s version. The Problem: When you travel the country and ask people to participate in a fun idea, the one fact you can be sure of is that they would LOVE to share their experience. Chances are everyone who participated in this effort told at least five friends about it. Yet there is no way to connect all of them with each other and let their stories become a deeper part of how people can go behind the scenes. The Solution: Go beyond a simple hashtag to create a visual way to aggregate people’s experiences of the campaign. This could be through something as simple as a Tumblr blog for the campaign or a Storify curated recap of the campaign. When I wrote about the “best marketing campaign ever” a few years ago, a major reason was because of how they managed to engage all the participants in sharing and telling stories to each other. 5. Answer the “so what?” question. The Problem: The way the campaign is first introduced, the brand asks an interesting question about what would happen if they traveled 3000 miles to unite Americans by asking them all to sing the same song for the holidays. The cultural context behind this campaign was perfect, coming off a hotly contested election and some media polls citing that America has never been more divided on a partisan basis than we are today. Uniting America sounds like a great idea – but the end result of this campaign seemed to be a nicely edited video. What was the REAL impact of getting all these people together to sing? The Solution: What if you could share the positive feelings that people likely felt after participating – through interviews or quotes? Politics probably never came up in the project – which is the ultimate proof point that despite our disagreements, we can all agree to get along if we just have the right motivation and situation to do it. I have worked on dozens of social media focused marketing campaigns over the past 8 years and not effectively engaging the people involved in content creation or attending an experience is one of those mistakes I see most often that can keep a good idea from becoming great (and winning awards). This could have been one of those ideas. 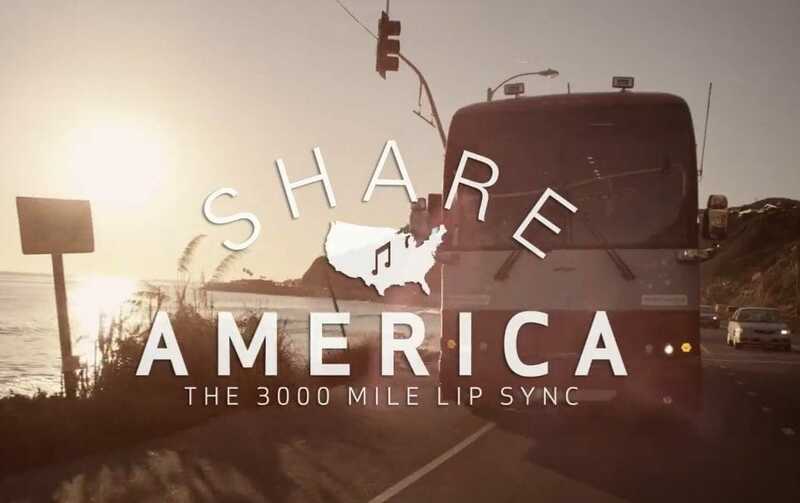 In a divided country, something as simple as a 3000 mile journey asking people to lip sync a holiday song might be just the medicine we need to reunite with one another. And not telling that story is perhaps the greatest missed opportunity of this entire campaign.